In December of 2012, I became a certified scuba diver. I didn’t go anywhere fancy for my “check-out” dive after spending a pool weekend in SoMa, just Monterey, CA. It was a dreary, drizzly day indeed that we submerged ourselves in the 55 degree waters and descended to the depths. I’d never been afraid of scuba diving or swimming or anything else rational, but I did feel acutely, for the first time, what it was like to exist in an alien environment. I thought I was far too smart to freak out, but I did end up experiencing moments of panic, even when I knew I had plenty of air and that I was in the company of experts and that there was nothing to fear. Despite this irrefutable logic, occasionally I would be hit with the intense feeling of “I want to be above water NOW,” with my mind instantly starting to circle the dark what-if places. But then, the gods of Monterey would whisper softly in my ear, “Breathe. Just breathe. There is air in your tank. There is a regulator in your mouth. Breathe, you fool.” And I would, and it was fine, and I could enjoy the kelp forests swaying beneath the surface in a never ending song, stretching up past where my brown eye could see. Shortly after my scuba diving adventure, I experienced a moment in which I was stressed out. Somehow, all of the tasks I’d ever lined up for myself became compressed into a single moment, and I bore the entire weight of my 20, 15, 10, and 5 year goals at once, along with my various daily to-do lists. It was paralyzing, and I tasted the familiar flavor of panic and inadequacy. Then I remembered what the gods whispered to me under the sea, as I rocked back and forth next to the kelp forests, and I remembered that I could breathe, that I had everything I needed at that moment to survive, and that I would survive. Then, all my goals and to-dos slinkied back out to a normal distance, and I was okay, but only as long as I kept breathing. If you liked this post, you might also like: What Improv Taught Me about Life, The 24-Hour Starbucks on California Street, and The Elastic Minutes. I’ve never been scuba diving, though I’d love to go, even though I’m a poor swimmer. So many people I’ve spoken to who’ve done it talk about the strange and suffocating feeling of dislocation, of being somewhere they shouldn’t, and of wanting to get out because of that. Must be quite something to experience and learn to breathe through, literally and figuratively. The thing I think I’d really struggle to do, though it looks exciting, is skydiving. What other experience would you now call off-limits following your dive underwater? I don’t think anything is off-limits. Maybe hitchhiking. I love scuba diving, though I am very new to it (just certified in September of last year), and my ‘check out’ dive wasn’t even as nice as yours. Being from Texas, there aren’t many grandeur underwater spots & mine was held in a some-what clear rock query turned lake. The calm and the quiet of the underwater is addicting! I too did my final “check-out” dive in Monterey Bay, many years ago. Mine was during August, but the water was still cold and very murky. I could barely see 12 inches from my mask. I had some buoyancy problems, and my partner descended into the depths without me. I watched him disappear below me into the dark water. But as you say, I had plenty of air and was in the company of experts, so it all worked out. 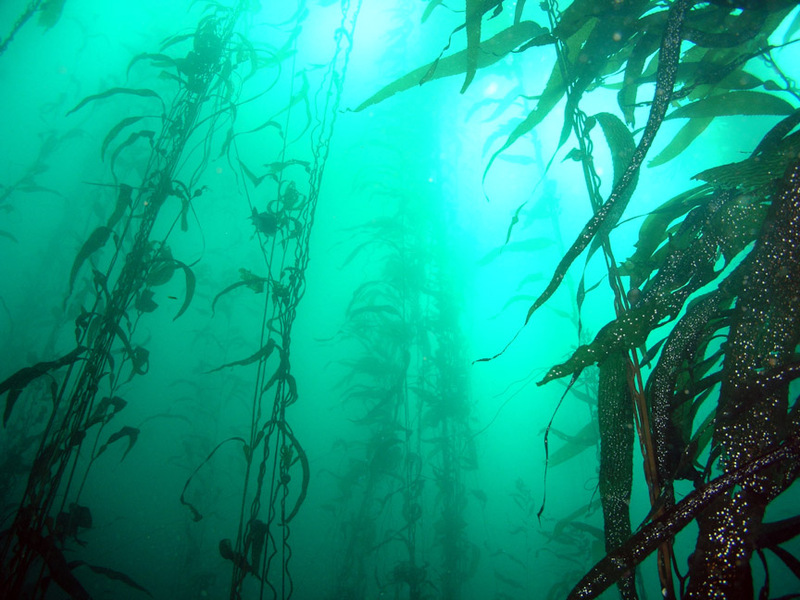 Fabulous post, I like the visual of the kelp swaying the water. Good on you, I am terrified of the water (ocean/sea) and would never consider scuba diving although my boyfriend loves it and keeps trying to convince me. Maybe one of these days! !